Each time that I book a trip to Europe for climbing, I get so excited. 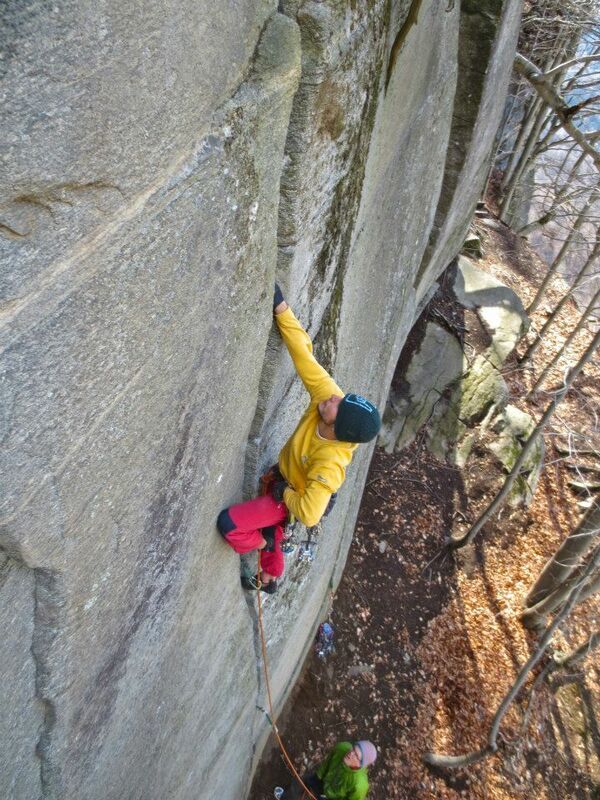 I dream of perfect lines, quality rock and sunny weather. These three factors are what keep you motivated during the long dark winter months slogging away on the training. There’s an ultimate reward for your sacrifice made at the altar of polyurethane resin and sanded wooden rungs. Not this time though. On one account I feel let down. Although the first two weeks of our trip to Italy were somewhat marred by rain on the odd day, it was negotiable. 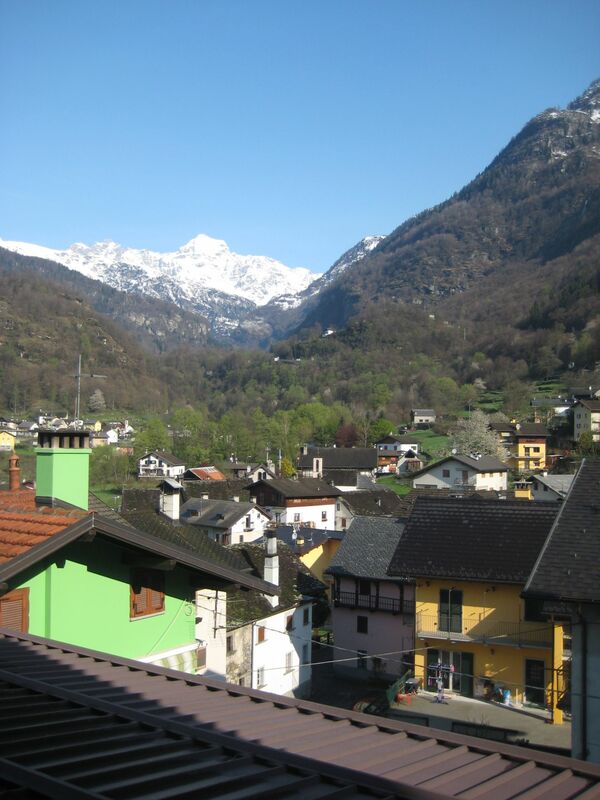 Our arrival in Orco Valley for the second week however, marked a change in luck. In Orco, Peewee was there to try Greenspit and I wanted to do a link-up project and an unclimbed finger crack that I’ve tried for a couple of years now. Going back to Greenspit with Peewee was great fun and kind of relived a period of my life. Getting back on the route with Peewee brought back all the memories of good times, frustrated failures and stupid antics with Sheffield mates on the belay. Each jam seemed like an old friend that I’d not seen for ages. All a bit weird, but that’s how it felt. After showing Peewee some (decidedly dodgy!) beta, I set to work on trying a link up project I’d conjured up a while back called the “Pura Pura Project.” It links hard low-level 8a+ crack climbing into 8b route crack, with the crux right at the end. If Dani Andrada knew what a crack was, I’m sure he would approve. Maybe?! After some work, I did the first section named “The Green Shadow” and started to think about how the whole thing would feel. By that stage a rest day was top of the list as my arms, shoulders and skin were showing signs of wear. Before taking the needed rest, I wanted to squeeze in a quick bit of time on the finger crack project that Pete and I have tried in previous years. I coud see that the weather was forecast to get a little worse for 2 days, so I ignored the temptation to pace myself and knew time logged on the project would be worth it. The line I wanted to try is a short, but steep and powerful finger crack. It starts at 45 degrees, hits a roof, then kicks back to 30 degrees, before attacking a final offwidth roof crack. Traditionally I’ve not been that great at really powerful climbing, so I was curious to see how my winter’s training had paid off. There were two moves at the crux on powerful finger locks that I’d not even been able to do in isolation in previous years, so this was potentially a great litmus test for improvement. Pulling into the crux sequence again, two years later, I was still dismayed by the size of the holds. The first finger lock was even poorer than I remembered, but the second matched my expectations. Frigging the gear and moves, I pulled into position to try the dyno crux off the finger lock as a starting point. Holy crap – I could do it! I didn’t expect that. Where my arms wilted in previous years, I now had a morsel of power to do something with. What a revelation. I’m sure that there are plenty of other endurance-based climbers out there like me, who will understand how amazing it is to feel – for once in your life – that there’s some muscle fibres actually doing you a favour! I was like a drug to my ego and my confidence surged. Not long after I had the even harder move setting up into the dyno done and then even whole sequences started to flow. Feeling positive about our progress in Orco – I’d got some good links, Peewee was cruising on Greenspit – we finally allowed ourselves the rest day. That day marked the turn in weather. At first it drizzled, then it poured and finally it snowed. Everything was drenched – even the roofs were soaked. Morale plummeted as Peewee wallowed in back-to-back double expressos and I, in my jumbo pack of salted peanuts. He was developing caffeine induced twitch every time the word Greenspit was mentioned and I got slowly fatter. Even our photographer Alex Ekins, was chanting in the corner of the bedroom obsessively polishing his lenses. Before we fell into a crack-deprived coma, we pulled ourselves from the depths of despair to make a decision on what we were to do with our last two days in Italy. We’d not climbed a route for 4 days and time felt so precious. 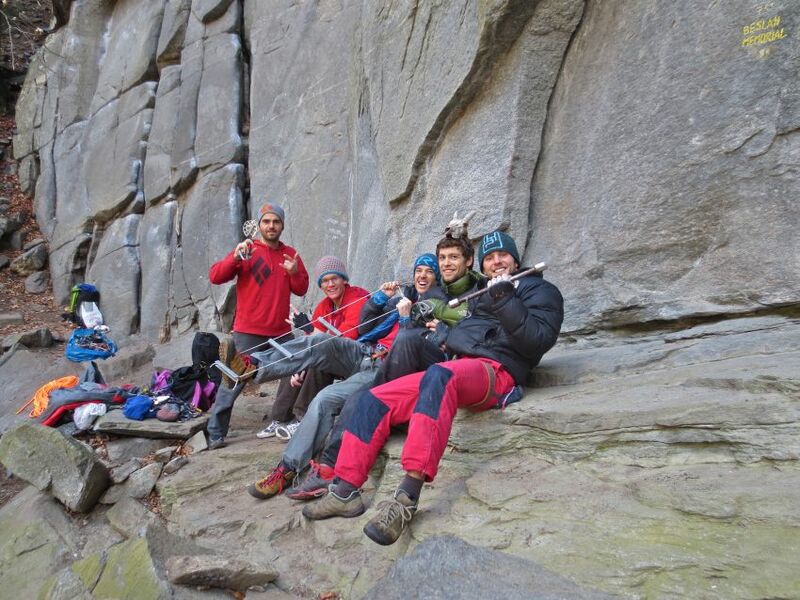 As a last resort we decided to return to Cadarese to either try an unrepeated 8b crack route called “Clenched Teeth” or at the very worst do some training laps on some perma-dry bolted cracks. Adrian Samarra from Hotaches Films had joined us by this stage so I think he was a little relieved that he’d be able to film something more interesting than me and Peewee discussing whether Nico Favresse or Yuji Hirayama was our ultimate holiday bromance. Back in Cadarese, we found either mini-waterfalls cascading down our routes or cracks running with water. This left me with only one obvious option; to attempt a 7b+ finger crack in a waterfall (I hate cracks running with water). This climbing scenario actually required some very interesting climbing tactics. You had to wear your chalkbag in the front (or it filled with water), you couldn’t look upwards too much (your eyes filled with water) and no horizontal crimps were allowed (they were filled with water). Finally making it to the belay after copious amount of falling and 100% effort I was rewarded with a great feeling. It doesn’t really matter sometimes how bad a route is, or what grade it is. As long as you have a good laugh and try hard. What more can you want?! Finally just a 12 hrs before leaving Italy, the rain stopped and we could finally try Clenched Teeth (photo below). After a few hours, I had sore fingers and long links done but alas the redpoint crux as the final move made success unlikely on that last hour. I left Italy happy though – I’d met some great local climbers, visited brilliant crags and got to measure up if my training is heading in the right direction. Hopefully, I’ll be returning again very soon. Over the last week, Peewee, Alex Ekins and I have continued on the mission of trying out some of Italy’s finest crack climbing. 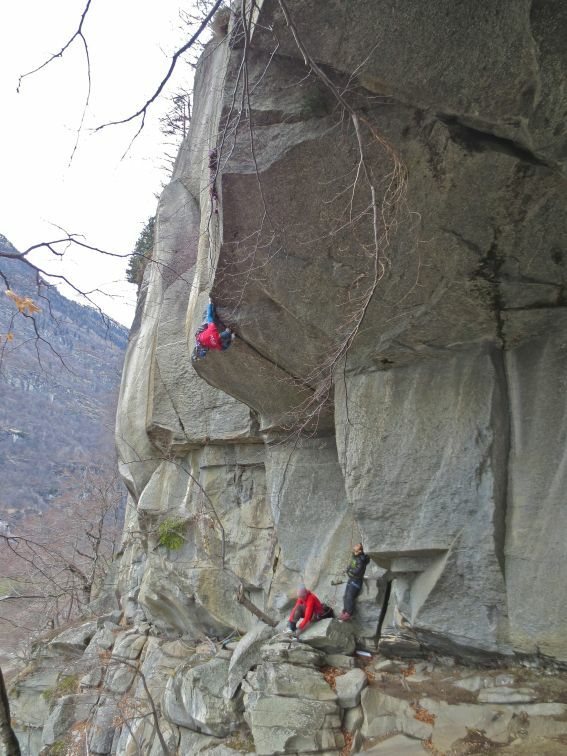 Since arriving in Cadarese, I was immediately impressed with how good the quality was and after talking to the locals, I realised there were many hard crack routes that I’d never even heard of! Meeting David Bacci, Saro Costa and Hattori Hanzo in Cadarese. Good fun! After a couple of days warming up on the cracks at Cadarese, Peewee and I went up to try an amazing splitter finger crack called The Doors, 8a+. This route didn’t even get a chance to disapppoint – not even for a single second. It’s an amazing 45m slightly overhanging finger crack that takes in almost every size possible (despite being a finger crack!) and holds back suitors with three brilliant cruxes. Climbing The Doors has to be one of my favourite climbing experiences; hard enough to be absorbing but not too difficult that you couldn’t enjoy it’s beauty and variation. Matteo making the first trad ascent of The Doors. Brilliant! 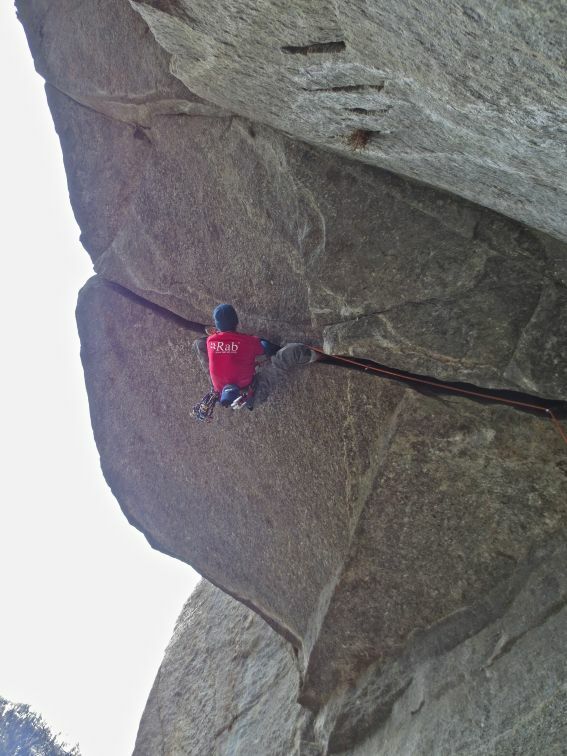 Wondering what to do next, I asked some locals about suggestions for other good finger cracks and time and time again I heard the name “Profundo Rosso” an 8a+ that Yuji Hirayama had climbed during his trip in 2011. Heading down to the crag the next morning, I couldn’t believe how good the line looked – yes it had bolts in it, no it wasn’t a perfect splitter, but I loved the tsunami wave of rock that it split. Sometimes, ugly is good. Starting off on the pitch, I had a rude awakening on the offwidth start; oh dear how rusty my handstacking and kneelock technique felt. After 40ft though, it narrows back to hands, but then starts to kick back to a much steeper angle. At the steepest section it pinches down to single isolated finger locks and some occasional edges to rest your poor skin on. Committing to the upper section, I felt reasonably at home and decided to ignore my doubts that I’d not be onsighting 8a+ today. At the last bolt I was faced with the dilemma of which hand to lead into the final finger lock – agh, right or left? Right or left? Lactic acid left me little choice and I stabbed upwards with intuition. I hit lucky and the choice was the right one. 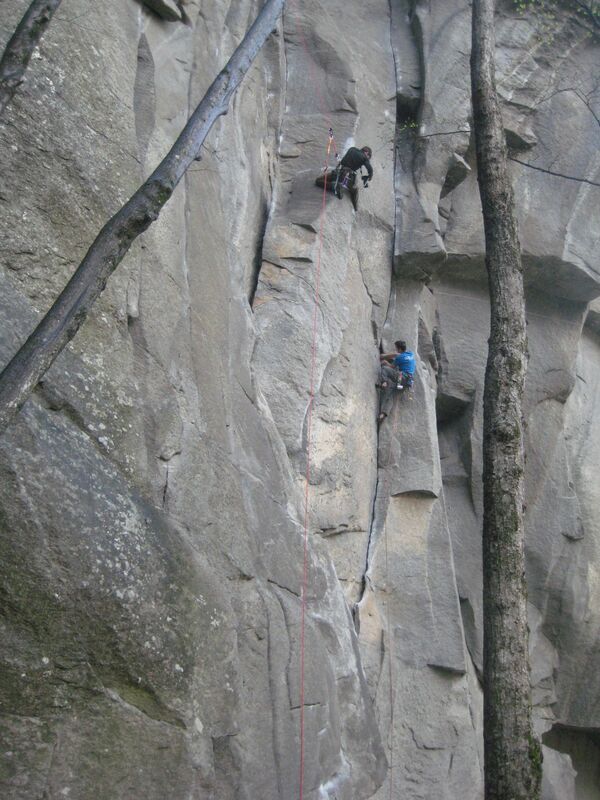 I reached up over the top of the crack towards to the belay and found a horrendous sloping pocket….. Dangling on the rope moments later I wondered if I’d made a bad choice, but searching around I found a hidden hold that I’d never have spotted. Oh well! I returned to finish the route the following day on the way to Orco Valley – overall a touch harder than The Doors and perhaps mid 8a+? Coming back to Orco Valley after 2 years away has been a strange experience. I’d sort of got the “Orco Bug” out of my system, but within 5 miles of valley driving and constant spying of new lines to do I have been drawn in again. This valley is so good, I honestly think it’s the best trad climbing destination in the whole of Europe. Peewee is here with me to do Greenspit and I’m keen to work on two projects. One is the “Pura Pura” Project which I dreamt up a few years back where a long hard crack boulder problem is linked into an 8b roof crack route to create a Dani Andrada style mega 8b+/c crack route. Sure it’s ridiculous, but why not?! The second is a steep finger crack that Pete Whittaker and I have spent a couple of seasons trying, but not succeeded on. Hopefully this last winter’s cellar training will pay off…. When I was first told about a new crack climbing area in Italy, I couldn’t believe it. I was in the midst of a rush of new routing in the Orco Valley and the idea that there could be somewhere bigger, better and with more potential seemed so unlikely in a country with with thousands and thousands of climbers. As I started to be sent photos of this new area in Cadarese I realised the rumours were true. Long, perfect pitches of splitter cracks in beautiful gneiss are set in quiet woodland just an hour or so away from Milan. A trip was planned and just a few days ago I got on a plane to find out for myself. Arriving in Cadarese on the first day with low cloud and drizzle, we were somewhat dejected. However, after a tour from two local climbers (thanks Saro and David!) we were shown that this crag is still totally climbable in wet weather. What a dream crag for a Brit! We quickly got stuck into some warm-ups which strangely involved bolted crack climbing. I’m not really going to pass judgement on how they’ve done things here, but it was certainly a weird experience doing a 30m hand crack with only 10 quickdraws on my harness. 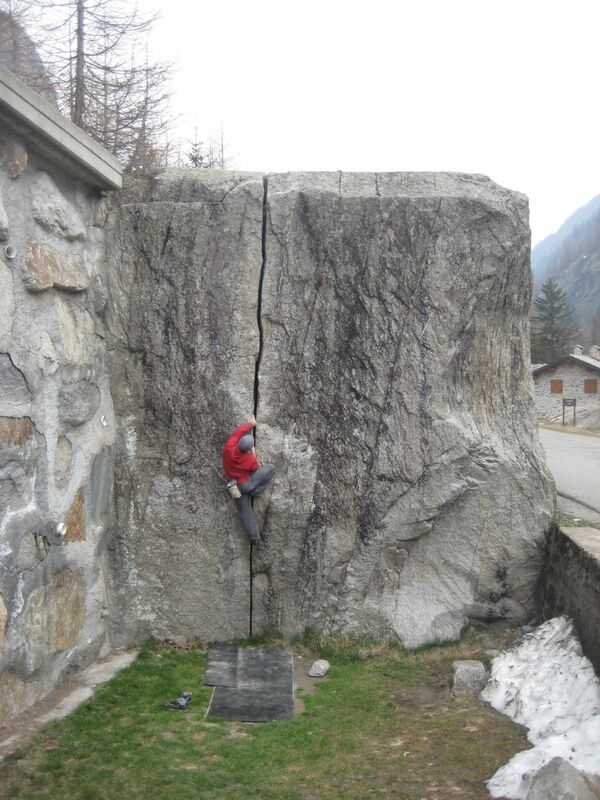 Perhaps if we had more of this in the UK our crack climbing skills would be better?? The highlight of my first day was doing an amazing steep 7b+ changing corners finger crack, which went at about E6 6b on perfect friend 1’s and 0.5’s. This pitch itself could rival some of the very best crack climbing in Yosemite and I started to realise why recent visitors to Cadarese include Tommy Caldwell, Yuji Hirayama, Nico Favresse and the other mental belgians to name a few. In the afternoon of the second day, I really wanted to try a route that I’ve heard talked about for a few years now. Turkey Crack was introduced to me as a project by an Italian friend; he told me of an incredible offwidth roof crack that a number of people had tried but no one had yet freed. I was psyched to hear this, but at the time I was training for Century Crack, so my priorities lay elsewhere. When I eventually heard that Sean O’driscoll (the mad Belgian bigwaller) had completed the task I was a bit disappointed, but I knew that I was my own fault for not being more proactive. Wide Pony from out of the closet once more. Why not? Tying in at the start of the route I had some big friends, a full tape job and a vague promise that I might be able to get some Wide Pony action – what more can a man want?! The route travels through a perfect 6 inch roof crack that splits an 80 degree ceiling of rock. At the lip, you’re aware of the exposure as the ground lies 300ft below you – such a position! Climbing the route was a real pleasure and reminded me why I started offwidth climbing in the first place and the cherry on the top was to climb this 8a onsight. afterwards it was great to help the Italian guys with improving their technique and passing on some of the tips that I’ve learnt over the recent years. It’s so motivating to see other people come round to thinking that climbing hard offwidths is something that’s kind of cool to do. The recent spell on continued cold weather in Sheffield has given me one of the best periods of climbing I could possibly hope for before going away on a trip. Normally as a Brit, you spend the last 4 weeks before leaving to sunnier places cursing the terrible weather and promising that it’s going to be a “one-way-ticket” this time. The whole of March though, has been awesome! Fresh winds, good temps and plenty of time to explore the crags that lie a little off beaten track. One of those crags that’s a bit out of fashion is Gradoms Edge. It’s often the last to retain the damp and being hidden in the trees, it’s quite hard to get psyched for the lines. They seem so much less impressive when there’s a forest of birch and oak 10m away… Once you get onto the rock though, there are some absolutely cracking lines to do: Moyers Buttress, Spanish Fly, Stormbringer, Eye of Faith. Aside from the old routes, there are also a number of first ascent projects – probably one of the best known being the direct finish to Charlotte Rampling. Having checked this out (yes, I’m too weak) I carried along the edge and thought I’d try the moves on a line I’d heard talked about by a couple of people. The front face of the Crocodile Buttress. Immediately, I realised the climbing was brilliant. Jon Fullwood had already cleaned the holds (thanks!) and so all I had to do was concentrate on learning how to “hug” my way up the leaning prow. This week I was persuaded by Pete to go out for an early morning session to get the route done, so that we could fit a big crack training session in, in the afternoon. I’d not really worked the route very well, so was falling off the last move on link, but I trusted that Pete would give me such a good belay that I couldn’t possibly fall off. Good logic huh? End the end, we had so much fun at the crag messing around and talking crap that I completely forgot to get nervous and topped the route! Pete made the second ascent the same morning saying it was one of the best routes I’ve put up. Don’t read too much into that comment though……… I’ve established some right choss in the past! Seriously though, I think it’s a nice piece of climbing for those that like gritstone funk.